Thank You to Alan & Jeffrey for this lovely article. 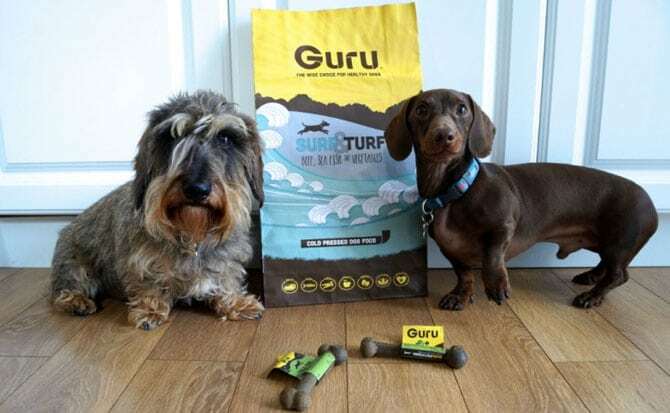 When Guru contacted me to ask whether I would like to try a sample of their food, I jumped at the chance (well jumped as much as my stumpy legs would let me) as their food sounded very interesting. And not only did they send Alan & I a sample of their unique cold pressed Surf & Turf food to share, but also a Field Trip Bone each! Guru was founded by Lisa & Andrew who were ‘home feeders’, preparing meals for their own dogs. They quickly saw the benefits in their dogs behaviour and overall health but found that preparing meals was time consuming and wasn’t always practical. In 2013 they set out to find a prepared food that was as close as possible to the home cooked food they had been preparing, adamant from the outset that the food had to be packed full of healthy ingredients and taste great too, Guru was born. Cold pressing is a unique method we use to prepare your dog’s food. The ingredients are ground then gently mixed together. This carefully preserves the nutrients before they are Cold Pressed at a low temperature of 44 degrees for just a few seconds. This unique cooking method retains as much of the ingredients nutrients as possible. This process is the main difference between our food compared to extrusion which uses high temperatures and pressures. 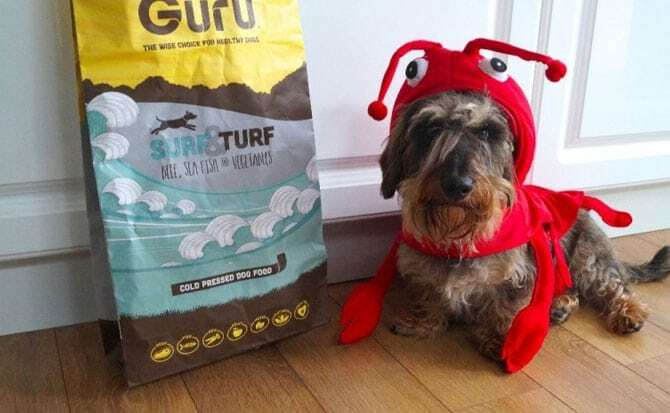 Not only is this food very nutritious for your dog but it’s also a fab alternative for those raw feeders out there, if you were unable to defrost your food in time for your pooch (shame on you!!) then to have a bag of this as back up would be extremely handy I say! We love the packaging, its bright but classy and the labelling is really clear. 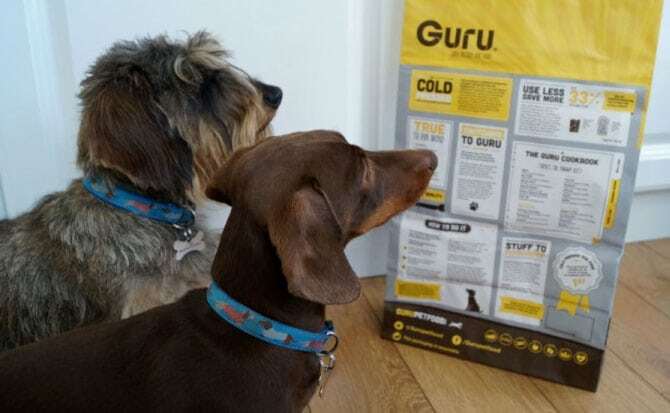 We especially love the symbols along the bottom of the bag which explain what is and isn’t in Guru Food which makes it easier for people to see at a glance when choosing the right food for their dog. 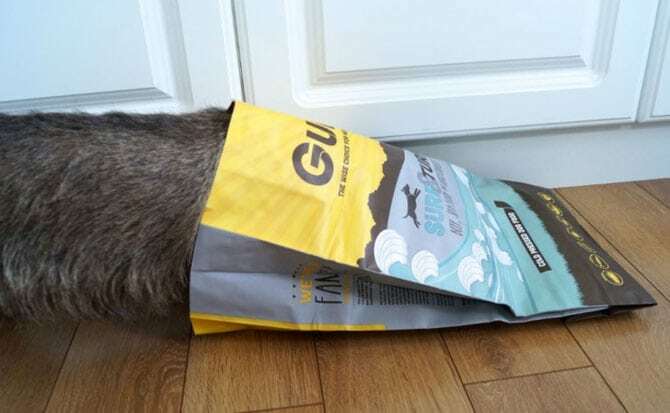 The back of the bag gives you all the information you need to know about Guru Surf & Turf food, the ingredients and feeding guides. Even if your pooch gives you the puppy dog eyes (which I have down to a fine art) you should only feed them the recommended daily allowance. The food comes in pressed square pellets, Mum said they reminded her of what she fed her Nanny’s ponies when she was a girl, you can either feed this in its original dry form or you can soak it in hot water for 5 minutes or so to create a warm stew-like dinner for your dog. Now to the most important part, the taste test – I can confirm, it tastes amazing! Alan & I both really enjoyed it, it was so nice and crunchy and we are partial to a fishy dinner! It tasted just as good as the first time! Mum said to make it even more real, I should smell like fish too however I think this was taking it just a tad too far! I would highly recommend you head over to Guru and check out their food and you may as well order yourself a sample or even go the full hog (or should that be cod?) and buy a whole bag! You can also grab yourself some Field Trip Bones ready for those long summer days out!